Narendra Damodardas Modi was born on 17 September 1950 at Vadnagar, Gujarat in India when Libra sign was arising in the zodiac.Present Chief Minister of Gujarat, India- Narendra Modi is the longest serving Chief Minister that state of Gujarat ever had in History.Narendra Modi became Chief Minister of Gujarat on 7 October 2001 and was elected for third time in continuation on 23 December 2007. 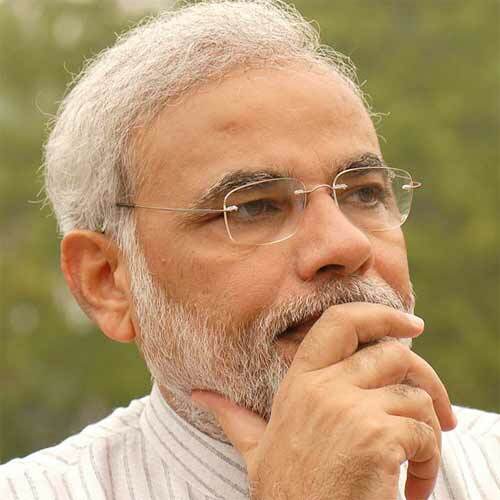 Narendra Modi is an active politician and member of Rashtriya Swayamsevak Sangh since his childhood. The lagna lord Venus is united with Yoga karaka Saturn in eleventh house; which is a very auspicious Yoga for Libra Ascendant.However, Saturn has become combust and lost most of its strength to protect and promote the significations ruled by it.In addition to this, the malefic lord of third and sixth houses, Jupiter, is placed in fifth house and having its full aspect on first house and on union of Venus + Saturn.Ninth house lord Mercury is exalted in twelfth house and united with Sun and Ketu in Narendra Modi Horoscope.However, Mercury is also combust and has become weak.. Astrology readings of such placements in Narendra Modi Horoscope match reasonably with his real life scenario. The strong influence of Jupiter, weakness of Saturn and Mercury due to combustion and operation of Saturn Mahadasa at the time of birth resulted into birth in middle class family. And, Narendra Modi had to struggle a lot in his life. For success in politics, sports and army; the strength of third and sixth houses are very prominent. In politics, one has to get over his opponent to prove his point which results in victory. In Narendra Modi Horoscope, the third and sixth lord Jupiter is favorably placed in fifth house. Yoga karaka Saturn and Venus both are casting their auspicious aspect over Jupiter; making Jupiter extremely strong. The sixth house is occupied by Rahu, which is also a very favorable disposition of Rahu for victory over enemies; and Mercury and Sun are having their aspect over sixth house. Though, being combust Saturn and Mercury themselves become weak; but their nature still remains the same i.e. positive for Libra Ascendant. And, with whatever strength they are left; both Saturn and Mercury are dispensing their auspiciousness to Jupiter and the sixth house. Therefore, it is the strength of third and sixth houses along with Jupiter which made it possible for Narendra Modi to achieve uninterrupted victories in his political career. The second house is occupied by Mars and debilitated Moon. The significators for third and sixth houses Mars is placed in its own zodiac sign Scorpio and tenth lord Moon joins there in its debilitation sign. Weakness of tenth lord again acted in support for Narendra Modi Horoscope; and he never remain inclined towards having a family and job. Jupiter as lord of third and sixth house does had its inauspicious impact over Narendra Modi Horoscope and denied him with happiness of family, progeny (children) and domestic life. Saturn, rules over fourth and fifth houses of Narendra Modi Horoscope; and both houses are related with mother, domestic life and child; and Narendra Modi remained unattached and/or deprived of these aspects of Human life. It was during Venus/Saturn/Rahu (Mahadasa of Venus, Antardasha of Saturn and Pratyantar dasha of Rahu) when Narendra Modi was made Chief Minister of Gujarat. And, as it had to be – it was a very challenging task for Narendra Modi. The economy of Gujarat was reeling under the adverse effects of several natural calamities, including a massive earthquake in January 2001. And, the strong Jupiter in Narendra Modi horoscope helped him significantly and he decided to take the bull by its horns.Narendra Modi horoscope is one planet phenomenon i.e. Jupiter; and more opposition and rivalry will make it stronger. Since August 2011, the Sun/Venus Bhukti is operational on Narendra Modi Horoscope and till July 2012 the planets are in his favor. This is the last Antardasha in Sun Mahadasa; and is likely to be extreme strong and supportive for Narendra Modi. He will be able to curb all opposition, of any kind and remain victorious. The next Mahadasa of Moon, which will commence from August 2012, is however not appearing much favorable in Narendra Modi Horoscope. Right from start of Moon Mahadasa, Narendra Modi may face health issues and severe problems in his personal life. There may be fear of losing post and reputation; and he may not be able to manage his political affairs as done in past. The reason behind this is the influence of Mars over Moon and Jupiter. Being lord of second and seventh houses; Mars is a Maraka planet for Narendra Modi, and being in its own rashi in second house, Mars has attained significant strength. The Mahadasa lord Moon is debilitated and united with Mars in second house; and Mars also has its fourth aspect over Jupiter. In Navamsha Chart of Narendra Modi horoscope, Mars has become debilitated and Moon has acquired the zodiac sign of Mercury.Therefore, the astrology readings of Moon Mahadasa are not looking promising and strong enough for Narendra Modi Horoscope.